The Giordano RS700 Hybrid Bike comes with a blend of features that make it perfect for a wide range of activities. Serious bikers know that biking is a way of life and a very serious commitment if you want to excel at it. But biking can also be just about having a good old time and either way, choosing your equipment is the first step in having a successful ride. The Giordano RS700 Hybrid Bike is a great option for men who want a real road bike with the comfort of a flat handlebar. The following review will cover everything about the Giordano RS700 Hybrid bike. These types of wheels offer maximum performance in both road and mountain cycling. They are pretty wider and can be filled with a higher air pressure. The wheels decrease the ground resistance and allow for a higher riding speed. The rims and spokes are quite aerodynamic, and thus also boosts the traveling speed. Made of aluminum, you can expect the frame to be light and durable. Since the frame is a main contributor of weight in a bike, you can expect the RS700 to be a lightweight bicycle. The steel fork makes the affordable bike a bit rigid and sturdy. If you are looking for a hybrid bike that will offer you excellent rides for a long time, you can consider this Giordano RS700 Hybrid bike model as it is durable with the combination of aluminum and steel parts. The Giordano RS700 Hybrid Bike is equipped with Shimano shifters and derailleurs that offer uncompromised and top-level performance. The 21-speed gear system is one of the things that make the this bike great for a number of activities. The gear shifting is quick and you can ride up on a mountain at a higher speed compared to most similar bikes out there. Shimano shifters & derailleurs are usually durable, so you don’t expect them to develop malfunctions anytime soon after purchasing the cheap bike. This type of handlebar adds a lot of comfort and convenience to the best hybrid bike. Together with the real road bike geometry, the flat bar handlebar provides a more aggressive riding position. If you have been using a bike with a traditional road handlebar, you can try something new Try this flat bar handlebar bike and you will experience a new world of enjoyable cycling. The breakdown of this bike starts with its lightweight but incredibly durable aluminum frame and steel fork. It’s a sound design that also allows for speed and easy of transportation. The shifting allows for up to 21 speeds, accounting for any and all types of terrain imaginable and any level of rider. It’s ideal for the taller rider, sitting most comfortably with those 5’9″ to 6’2″ and the 700c wheels are ready for anything nature, or you, can throw at them. It’s 73 inches at its tallest point and 69 inches at the lowest. The Giordano RS700 Hybrid Bike is designed to offer flexible rides in any environment. 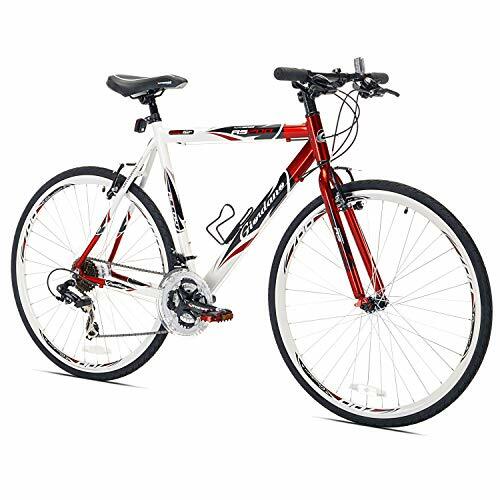 It is perfect for daily commuting, city riding, getting in shape and other activities. It is available in 2 sizes (medium & large) which means that you can choose the size that suits you. So, this bike is probably best suited for the casual beginner looking to up their bike game to something that’ll last them a little bit longer than a bottom dollar, retail bike. For the serious bike enthusiast, maybe look into more solid options.